In the last lesson we saw the nature of Jesus’ gospel as self-emptying—sharing or giving up privileges for the sake of others. Yet the Roman pyramid of patronage defied such egalitarian relationships. Thus, beginning in 1 Cor. 3:5, Paul attacks a problem many Christians will recognize—competition between church leaders and their factions. Apparently, Apollos is Paul’s only significant rival for leadership among the Corinthian churches. His superior eloquence has quite possibly attracted more believers of higher status. Patrons with more wealth and influence are changing the character of the house churches. But Paul never denounces or shames Apollos. Using images from agriculture and architecture, Paul insists that he and Apollos are working together to grow fine crops and to build a beautiful structure on the firm foundation of Messiah Jesus. Read through 1 Corinthians 3:5-23. 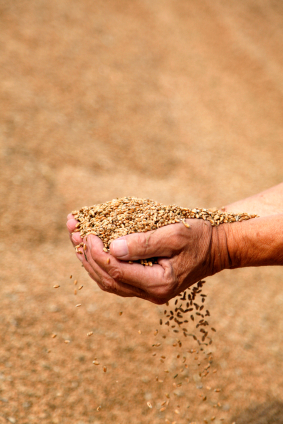 How does Paul encourage a spirit of cooperation rather than competition? But what do you make of 3:12-15, where Paul uses the image of fire to purge poor quality building materials? Is he hinting that Apollos is building with inferior materials—watering down the radical message of the cross of Jesus? Or is it rather a warning to “those of Apollos”—who still may be “wise in this age” (3:18)—that they themselves will be destroyed and Apollos will have little to show for his efforts? Young Christians are often told to keep themselves pure because their individual bodies are temples of the Holy Spirit. Though this concept is biblical, in 3:16-17 the “you” in “you are God’s temple” is plural. The Corinthian church is collectively a temple in which God’s Spirit dwells. Do not break this temple into four factions! Paul’s image of the church as temple may have shocked the Jewish believers in Corinth. At that time, the magnificent Herodian temple was still standing and represented to most Jews the place where the Presence of Yahweh dwelt. Do these small bodies of believers now replace the temple in Jerusalem? This idea would not have been totally new to a contemporary group of Jews, the Qumran community of Essenes, who wrote some of the Dead Sea Scrolls discovered in 1947. This priestly, law-observant community saw itself as a Temple-in-waiting until God would destroy the corrupt Temple system. But Paul claims that both Jewish and Gentile Jesus-believers comprise God’s temple—that is truly ground-breaking. In 3:19 and 20, Paul quotes lines from Job and Psalms that link worldly wisdom with economic injustice. He first says that God “catches the wise in their own craftiness” (Job 5:13). The “wise” in the context of Job 5:13-16 are those whose economic schemes abuse the needy (think of Wall Street excesses, the recent LIBOR banking scandal, or Rep. Paul Ryan’s austerity budget proposal). In 1 Corinthians 3:20, Paul quotes from Psalm 94:11. The overall message of this psalm asserts that God avenges those who kill righteous widows, strangers, and orphans. The phrase, “nothing beyond what is written” in 1 Corinthians 4:6 is puzzling, but Richard Hays’ Interpretation commentary notes that it probably refers to the six scriptures Paul has already quoted which are introduced by, “It is written” (1 Cor 1:19, 31; 2: 9, 16; 3:19, 20). Most have to do with status issues: wise and foolish, privileged and poor. How do they relate to the last part of 4:6—“so that none of you will be puffed up, in favor of one against another”? The Colosseum is an iconic symbol of Imperial Rome. It was built 70-80 CE during the reigns of Vespasian and Titus. 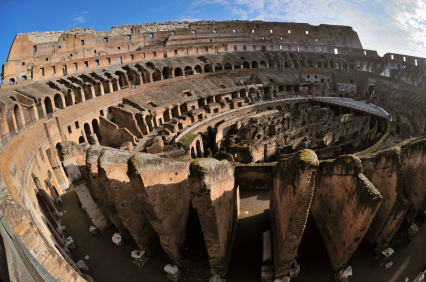 Capable of seating 50,000 spectators, the Colosseum was used for gladiatorial contests and public spectacles such as mock sea battles, animal and gladiator fights, executions, and re-enactments of famous battles. Christians in Rome and other large cities of the Empire became “spectacles” in arenas like this. In 1 Corinthians 4:9-13, Paul declares that he and other apostles have become a spectacle to the world. He alludes here to the common practice of victorious Roman generals marching home with their troops, while “last of all” trudge their prisoners—trophies of war who are then executed or sold into slavery. The Corinthians held their own spectator sports. Like the current trilogy, The Hunger Games, they watched gladiators and condemned criminals fight to their deaths in the arena. In 4:14-21, Paul’s tone changes to that of a caring father who wants to correct and discipline his children. The “stick” of verse 21 (NRSV) is better translated as the “rod of correction” parents were encouraged to use at that time (i.e., Proverbs 22:15; 23:13-14). This ends the theological foundation of Paul’s case for unity. What follows, beginning in chapter 5, is practical advice for living it out. 1. What role does the “spectacle” text (1 Cor 4:8-13) play in this section? Why are apostles “the rubbish of the world” (v 13)? 2. How differently might this passage have been heard by Corinthian believers at different social levels? 3. What kind of Christians today should hear Paul’s words about being “puffed up” and arrogant?